Basic skin colors in on her. She'll get a bit different detailing- which I'm still noodling out- prior to the first washes to show some muscle texture and such. Also plan to take the overhead shot into Photoshop and play around with the final eye pattern. As a distraction, usually while waiting for washes to dry, I worked on a trio of cultists/penal troopers who are about 90% done. Meatshields.... say hello to everyone. The plodding along continues. I'll be focusing on finishing up the tank gribblies and the hulls the rest of this week. Hopefully, I should have a post up around the weekend with some progress. Slowly, but surely. Is that even a word? 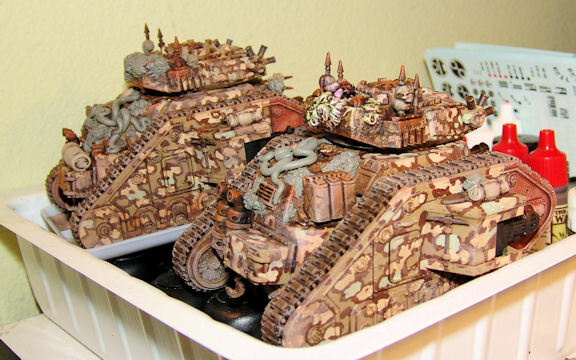 Well, anyone who does what we do for a hobby knows about those times where you are proud of yourself for assembling all those cool new miniatures you just got. They are primed, then you look at a hundred little plastic bodies and go. "Well.....sh*t, now I have to paint them all." It starts with the base colors and you spend the next 6 hours painting the same (usually unexciting) color over and over and over and over and over again. You find yourself making up goofy lyrics to your favorite songs, seeing double, getting cramps in uncomfortable places. Sometimes all you need is 5 or 6 vehicles to get the same "issue"
Yup, that's the week I've had. I wasn't going to post anything, because frankly, its kinda boring... but then over a rare dinner out this evening my wife said "Why don't you post about that? Its obviously something people can relate to." SO, how do you beat the mundane blues? For me, its throwing a bunch of different things on the desk. If I have to paint the same color all friggin' night, at least I try to paint it on many different things. I dusted off Blinky (and broke her off her base) to get her fleshy areas base colored as well as the sentinal trio. I did all the fleshy parts on the remaining 16 or so penal troop/cultists. The other little 'trick' I do to keep my sanity during these sessions is to have a "side project" to break up the single color painting. So after basecoating tentacles and gribblies, when I stop to change brushes or clean brushes (which I do every couple hours or so) ... I come back and do something a little different for a little while. In this case, it was the final camoflage brown on Leman Russ#3. 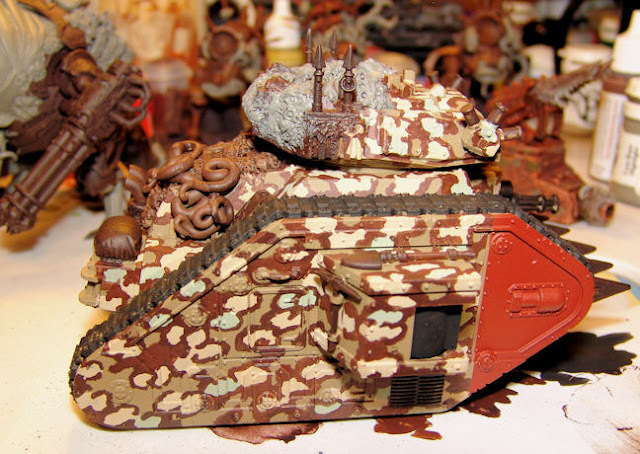 I'd do one side, then go back to painting greys for a while, then come back to the camo. Much more to do, of course. I still have over a hundred ratmen staring at me from under my desk waiting to become immortal rat zombies... at least that's what the brochure promised, because it'll really be more like stinky, undead meat shields in practice.... but they work for old cheese and stale corn, so we'll leave that little detail out. Then its time for some washes and glazes. GW Leviathan Purple, Waywatcher Green, Althonian Camoshade, even Baal Red in places. The next step will be to detail the skulls, the corpse and get to the rusty,corroded parts, they paint the periscopes and the turret will be done. Yah! Weathering and detailing is in full swing. 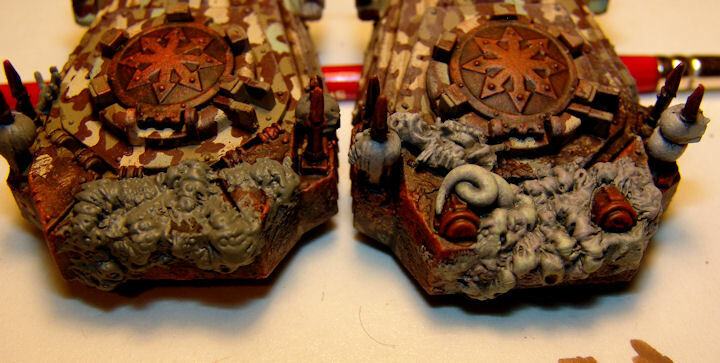 Both tanks were at the same stage, so now the drybrushing, washing and some weathering powders. The hull on the right has some Earth Brown weathering powder. I use isopropal alcohol and run along the edges, which helps them 'pop' a bit. The alcohol turns the powders into kind of a watercolor paint almost, it also helps fix it so it doesn't rub off. 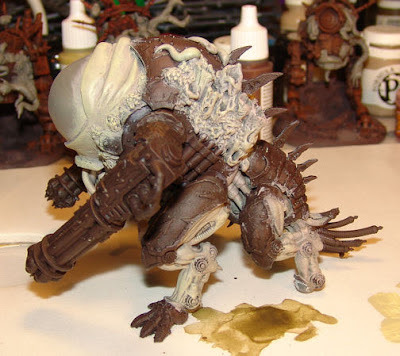 You always need to fix these powders with a dull coat for models you intend on playing with/handling alot. Otherwise you'll lose a LOT of your hard work and get fingerprints. A close up, the 'powdered' one is on the left this time. Still more weathering to come. 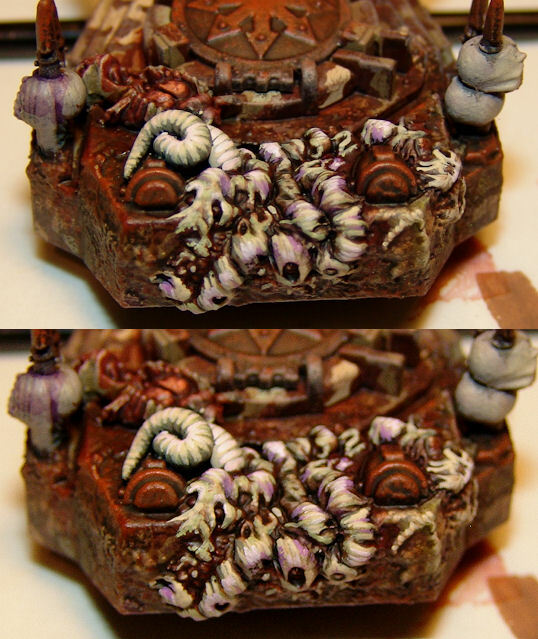 I've laid in the basic colors on some of the stowage and the fleshy,gribbly corrupted parts. 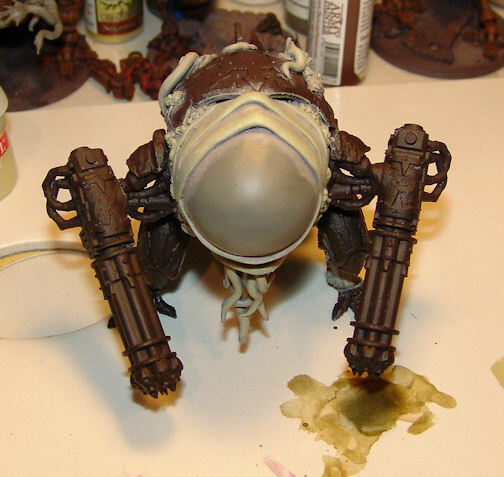 On the left is the base color P3 Cryx Bane Highlight. 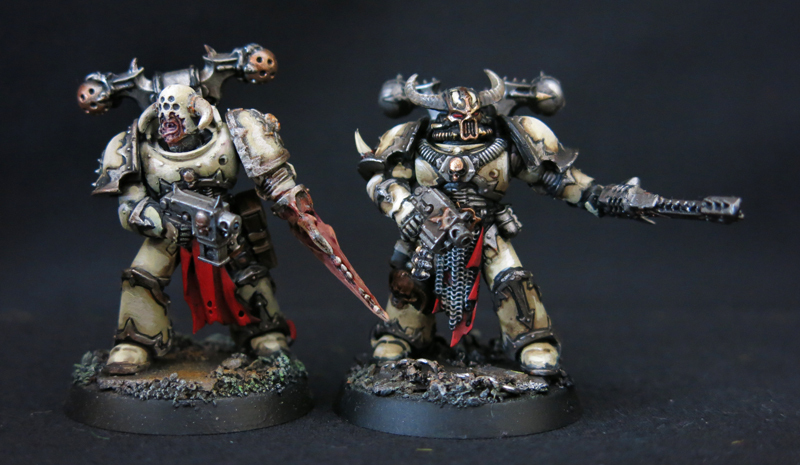 On the right, the base is drybrushed with GW Rakarth Flesh. 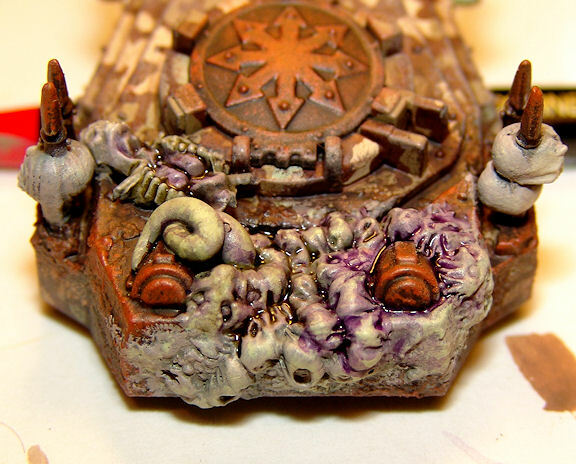 Then a bit of GW Rotting Flesh to highlight things. The first set of washes (still fresh as you can see) I start with GW Leviathan Purple wash. The right half is just the purple. 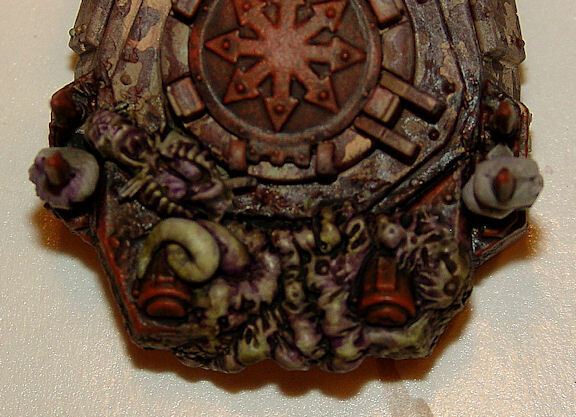 The left has a wash of GW Athonian Camoshade, which the whole thing will get. 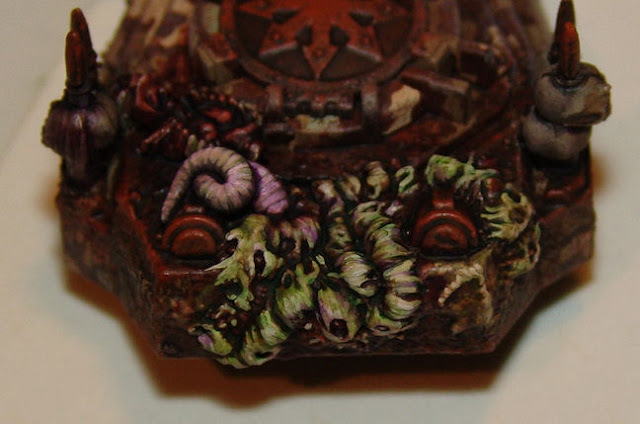 The tentacle on the left kind of shows the end effect better. Still more washes to go to make things look nasty. But.... that's where its at at present. I'm determined to get this project DONE this month, partly because I just want it off my damned desk, but MOSTLY because I really,really want to build an Ork biplane strike fighter. ADDENDUM: Here's a shot of the whole thing after drying overnight. More washes + more touch up ahead. That's all for now. Hopefully, I'll have more to post mid week.